One of my absolute favorite places to shop online for anything and everything natural beauty is at Citrine Natural Beauty Bar. I posted this photo the other day and promised you a full look! I’m so excited to bring you this “Glowing Skin + Smokey Eyes” makeup look showcasing smokey eyes that can be worn day or night! I can’t wait to visit the Founder (and my very good friend), Melissa Lenberg, this autumn at her brick and mortar location in Phoenix, AZ!! To be able to play at her elegant studio with her luxurious makeup selection will be pretty close to heaven on earth. Take a look at Melissa’s absolute beauty, inside and out in this video. This woman literally GLOWS. All the products I used to create the ” Glowing Skin + Smokey Eyes” look are from Citrine. They carry some of my very favorite brands. To start off by moisturizing and priming my face I used the Kypris Beauty Elixir III Prismatic Array which not only deeply moisturizes the skin but gives such a beautiful and natural glow. It also helps my foundation apply better so for me it doubles as a primer!! I used three drops of this beautiful oil on my skin, let it sit for a few minutes and then went in with my absolute favorite “foundation” (it’s actually a BB cream but it’s full coverage and buildable and I am obsessed with it! ): the Jane Iredale GlowTime BB Cream which I like to apply with a flocked sponge to give a very natural, yet dewy look to the skin. I set everything with a few spritz of Pommisst Hydration Setting Spray. To conceal my stubborn under eye circles I went in with the Jane Iredale Circle/Delete #2 (Peach) Concealer which combats darkness and also brightens up the area. I used a little around my nose as well, to help cancel out redness. Now for the super added glow I first dabbed the Kjaer Weis Dazzling Cream Bronzer onto the apples of my cheeks, extending up to m cheekbone. I used this to not only warm up my skin but also as a very light contour. For highlight, which is my personal favorite part, I applied Kjaer Weis Radiance on the highest point of my cheekbones, down the bridge of my nose a little on the apples of my cheeks. 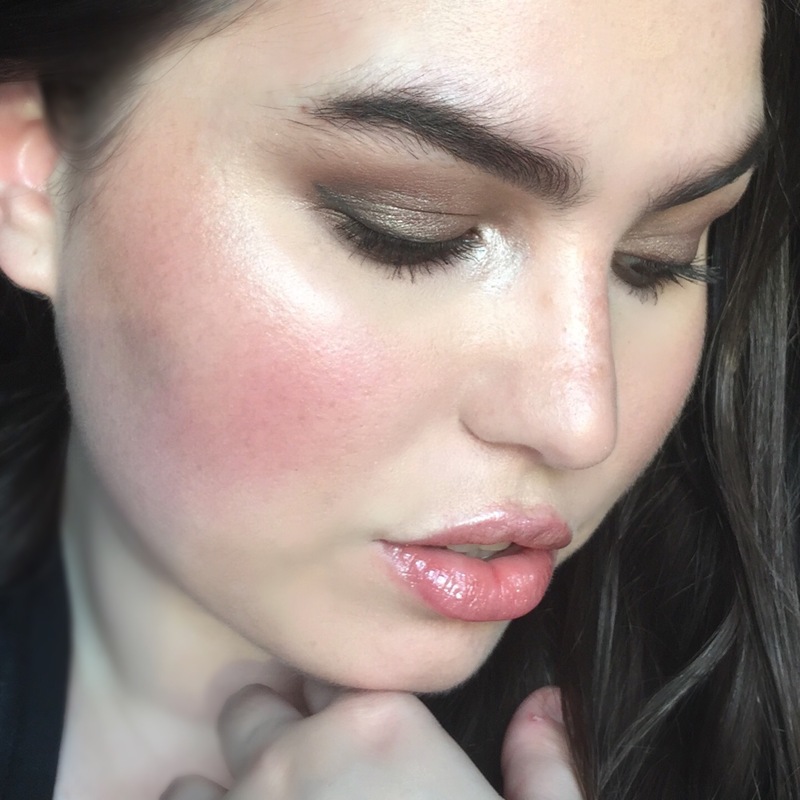 For blush I used Tata Harper Volumizing Lip&Cheek in Very Charming and applied to both the apples of my cheeks, blending upwards to meet with the bronzer. I used my fingers for all of these cream products as I find the warmth of your fingers really helps to blend these in seamlessly. To prime my lids I used a little of my concealer and then went in with the color “Cappuccino” from the Jane Iredale Daytime Eyeshadow Kit and applied this color all over my lid and up to the crease. I then took the color “Almond” and “Dark Suede” and blended these two into the outer third of my eye, up into the crease to add more definition. I also brought these colors down to the lower lid and blended with the color “Charcoal” which is the darkest color in the kit. For a highlight I used “Oyster” on the inner eyes as well as a tiny bit under my brow. To enhance the inner eyes I went in with the KW Radiance Highlighter and popped a tiny bit of this right at the inner corners of each eye. To line my upper and lower lashline I used Antonym Cosmetics Noir Eye Pencil and finished off with two coats of my favorite mascara; Perfekt Lash Perfection Gel Mascara. Jane Iredale Bitty Brow Kit in “Brunette” and set with the PureBrow Gel in “Brunette”. Tata Harper Volumizing Lip&Cheek in Very Sweet with KW Radiance Highlight added to the top and bottom lip to add a highlight effect. This is so beautiful!!! Wow. Beautiful as always Britanie😘 Please let me know when you visit Citrine-I would love to meet you!!! Just placed my first order to Citrine Beauty! Thanks for the discount code. Really excited to try the BB cream you used! You look gorgeous, as usual. I’m definitely eyeing the new Kjaer Weis bronzer! absolutely stunning! It always amazing how organic cosmetics can still create bold looks like this! So beautiful! I love the smokey eyes and beautiful blush! Stunning! I’m always a little more dramatic on the eyes and I love this look. Isn’t Antonym’s Noir pencil incredible? I use it almost daily to line my eyes in various ways. I also love the tata harper shade on your lips. I’m definitely going to try to get this look with some of my products (ie. Modern Minerals + Antonym have such great eyeshadows) that are vegan and cross my fingers that more brands start to sway towards vegan products (I really love what I’ve seen from jane iredale). But thank you for the inspiration, I’m always using greys more than browns and I’m definitely going to give my browns more of a shot, I know they are supposed to make blue eyes pop – in fact I have some of the new colors from Modern Minerals that are on their way right now with your blush! Thanks for sharing! I am always trying to perfect that smokey eye look! I also recommend trying Beausoleil Organics cosmetic products. I am currently a beauty blogger for this great startup company and they have a wonderful new line of eye shadows!